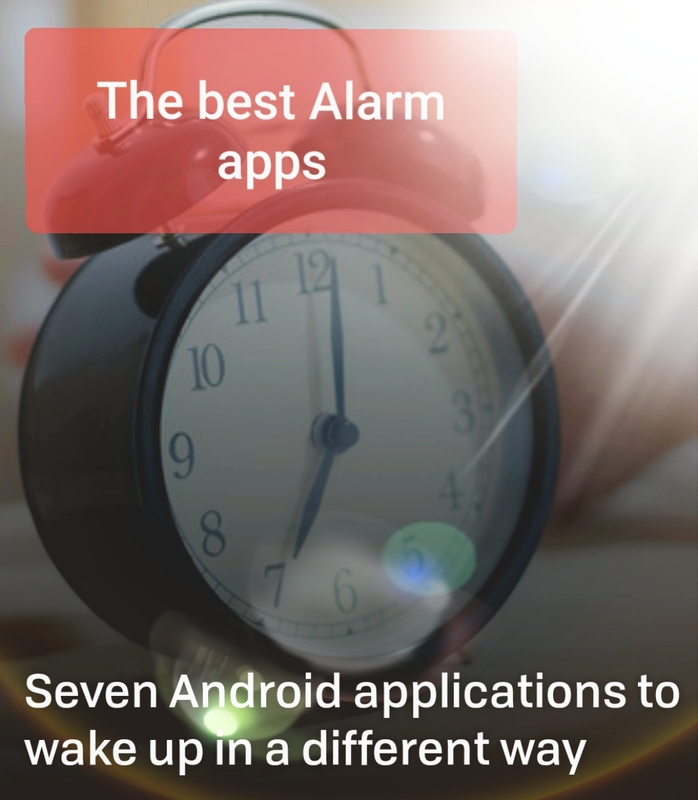 Today we are going to talk about the best alarm app for android. You have to see how hard it is to get up in the morning, right? Getting up early, getting out of bed and starting the day is not an easy task for many people, but there are apps that can help us to be more active or, at least, we do not fall asleep. You just have to search Google Play to find a lot of applications to wake up. Leaving aside those that only act as an alarm, we have selected some that invite you to start the morning in a different way. Probably, Alarmy is one of the most annoying (and effective) alarm clocks in the world. Why? Because if you do not get up, it does not go off . Its dynamics are very simple: you register a specific place in your house and, when the alarm sounds, you must go with your phone to that specific point and take a picture. Otherwise, it does not turn off. If jumping out of bed is too hard, the application also proposes two other ways to turn off the alarm: you can either solve a math problem or shake your phone until it stops ringing.The Alarmy app, which accumulates more than 10 million downloads, is free but contains ads and offers purchases within the application. 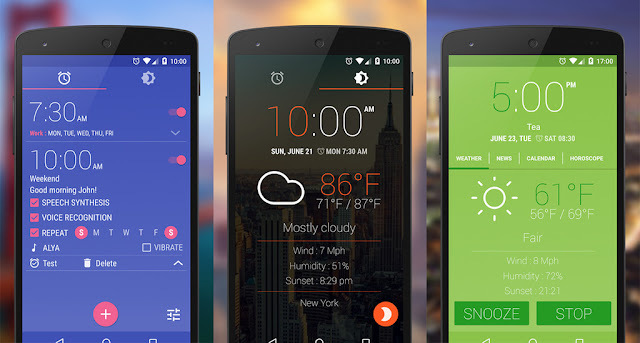 The objective of the Nebula Alarm Clock app is to create a kind of constellation system. Every time we wake up in time, the app will reward us with a star and when we get a certain number of astral bodies, we can build a constellation to complete all the maps of the sky that the application offers us. If we do not turn off the alarm on time or try to postpone the alarm, the star will become a violent supernova, and we will not be able to use it for our constellation. There are three methods to turn off the alarm : shake the phone, solve a challenge proposed by the app or scan a QR code that we have placed somewhere in the house (the bathroom, for example). The application is free and contains ads , but we can remove them if we buy any of the payment packs that will help us so that our stars are not destroyed. Timy Alarm Clock will help you avoid accidentally turning off your alarm clock and falling asleep.To dismiss the alarm you will have to disturb some funny characters. They comes in three (a cat, a dog or a rabbit), which in turn have three levels of difficulty, but you can unlock more. Ability to wake up with your favorite songs. Snooze function and independent volume control. The application is free, but contains ads. There is a normal mode in which you only have to press a button to turn it off. You can solve a math problem with five difficulty levels. Shake the phone between 10 and 50 times. Look for a QR code or a barcode and scan it. In addition, there is a premium version (without advertising) that adds two other methods: draw a pattern imitating the one proposed by the app as a sample and write exactly one random word that includes eight symbols . It also allows you to customize the type of vibration, the volume of the alarm and the song you want to wake up with. 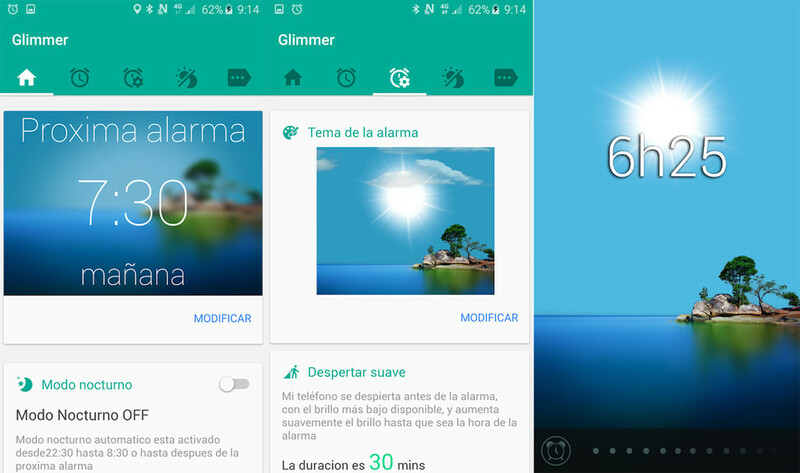 Thirty minutes before the alarm, the Glimmer application is able to gradually increase the brightness of the screen to simulate the sunrise and wake up more naturally. For this, obviously, it is recommended that the room be completely dark. During the increase in brightness a birdsong can sound , but if you do not wake up 1 minute after the alarm time, a loud sound is played to ensure you do not fall asleep. It also has a Night Mode that turns off the sound of notifications, disconnects the Internet, decreases the brightness . 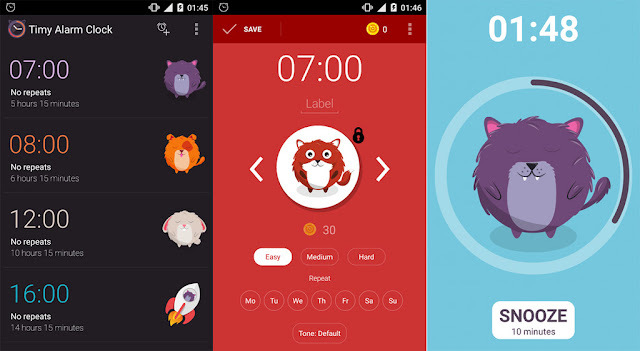 The download of Glimmer is free, but offers purchases within the application, for example, have more customization options. Through voice recognition, this application allows you to turn off or postpone the alarm from the bed by telling you . As it also has voice synthesis, it is able to read you the appointments of the agenda, the weather forecast, the latest news and even the horoscope. And all that information is displayed on the screen so you can consult what you need at the moment you wake up. It also has a night mode and a dock mode, as well as shortcuts to the music player and email . And if that were not enough, it includes fifteen languages ​​and you can turn on the radio automatically when you turn off the alarm. In addition to the free version, there is a premium for 3.59 euros . 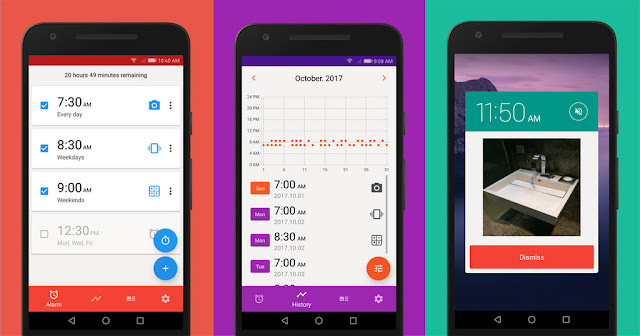 In addition to turning your phone into a digital clock, it boasts a nice interface (with several themes available) and functions of stopwatch and countdown timer. It also offers you the possibility to wake up with random musicaccording to your playlists and to postpone the alarm in three time intervals: 5, 10 and 15 minutes. To deactivate the alarm, you will have to solve math calculations or play a game. Of course, at all times, shows you the current time, temperature and weather forecast (which are updated regularly). The download is free, but contains ads within the app.